What to do with all the corks and caps, well until you decide, fill a basket. It still won’t answer the age old question, “corks or screw caps” but it’s pretty to look at and environmentally responsible. This entry was posted in Hodgpodge, Wine, Wine Photos, Words and tagged Art, Corks, experience, Life Balance, the modern world, Wine, wine industry. Bookmark the permalink. Ha! Yes, of course. Why didn’t I think of a basket? I’ve got corks lying about every which way. Just can’t ever seem to decide what to do with them, and refuse to throw them away. Thank you! Once you get enough of them in a low basket it makes a nice coffee table feature. Hey putting it on a coffee table works just great for a conversation piece. I would be embarrassed to tell you how many cork vessels (in sizes varying from totally reasonable to completely ridiculous) I have scattered throughout my house . . . I have not – great idea!! 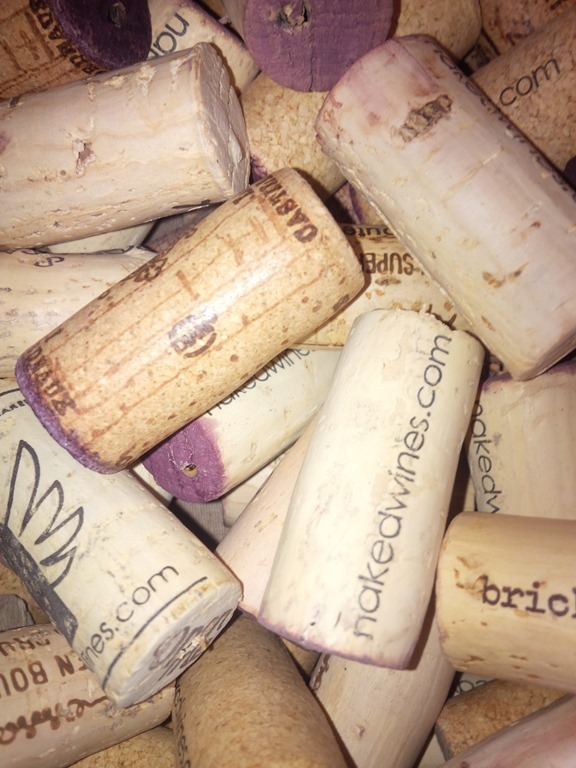 I have enough corks for about 457 different craft projects! I used to have at least that many until my wife put her foot down and sais she was tired of picking them up all over the house when our daughters dogs would pack them around. Now every other month I am a hero at the senior citizens center. But where do you keep the decanter? Storage or decoration.